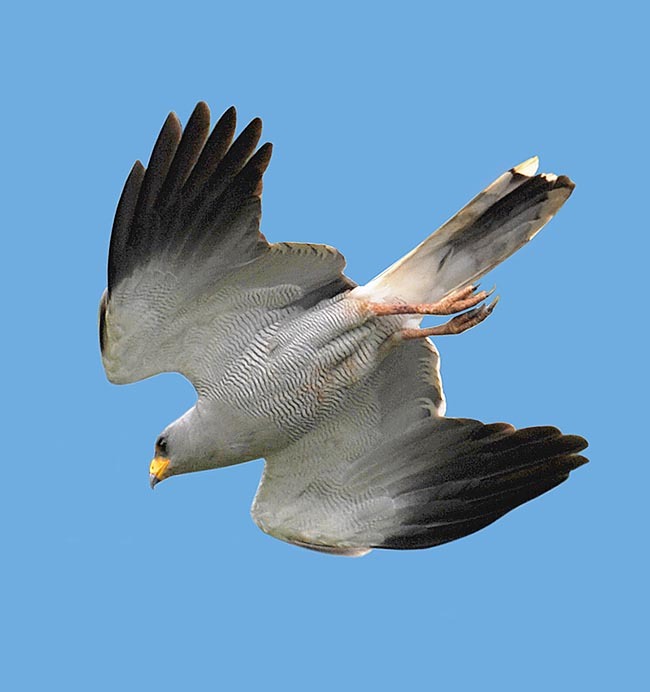 Still nowadays many experts insist in reiterating the facility in recognizing the Eastern chanting goshawk (Melierax poliopterus Cabanis, 1868), from the analogous Dark chanting goshawk (Melierax metabates) and from the Pale chanting goshawk (Melierax canorus), three different species resulting on the contrary rather difficult to recognize on the field without determining with precision the area where they are met. Omitting the Melierax canorus living exclusively in the extreme southern part of the African continent and that only partially overlaps with the Melierax metabates, the other two species share in various parts of East Africa the same territory mingling among themselves and creating that difficulty we were hinting. In Ethiopia, one of the first sub-Saharan areas where these two species are encountered, the only absolute and sure dominant for the recognizing is the place of encounter. If this is east to the Rift Valley, it’s the eastern, if it’s west, it’s the dark. A stripe of some kilometres is the clear demarcartion line between the two species. Southernmost, in Kenya, Uganda and then in Tanzania with the bifurcation of the Rift Valley, the distribution ranges mingle and overlap and the two species result amply coexisting. 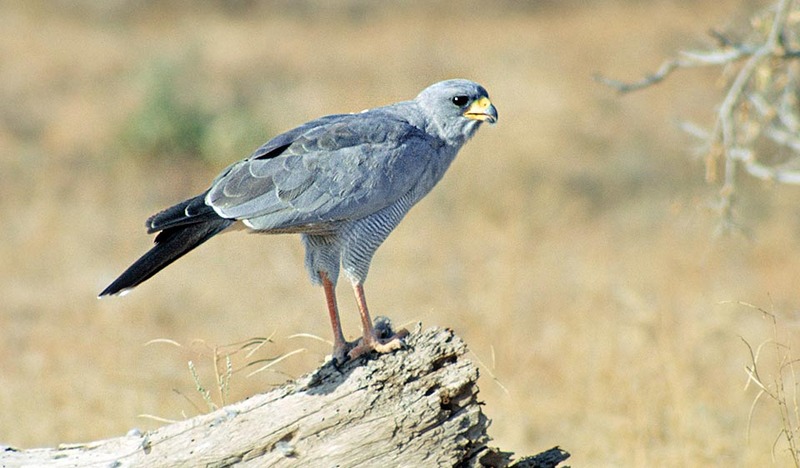 The eastern chanting goshawk is a bird of prey belonging to the order of the Accipitriformes and to the family of the Accipitridae and for some behaviours as well as for the size and shape, could be considered as the African correspondent of our Northern goshawk (Accipiter gentilis). 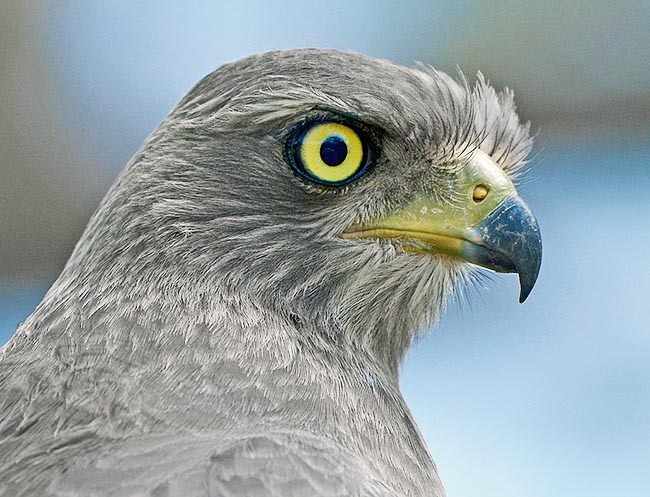 The chanting goshawk, as the vulgar name states, is a melodious raptor emitting pleasant warbles, sounds being totally absent or quite rare in all other raptors. The scientific name exactly reflects these characteristics as comes from Melierax the Greek “melos” = song and “hierax” = hawk whilst poliopterus refers to the colour of this bird : “polios” = grey, “pteron” = wing. Also the vulgar names given by various countries are close to these scientific versions. 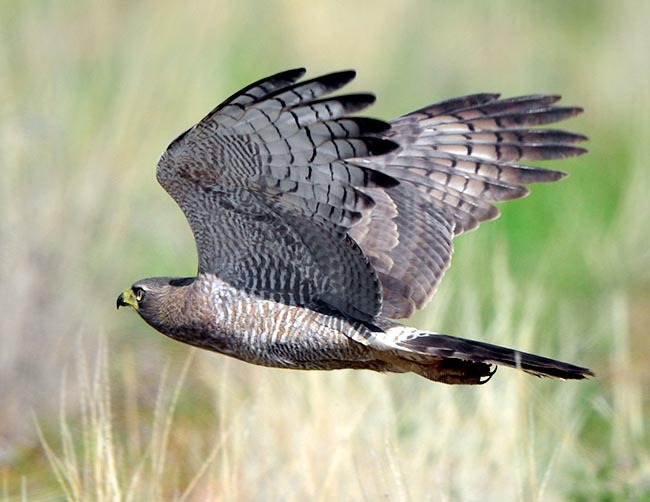 In English, Eastern chanting goshawk; in French, Autour à ailes grises ; in German, Weißbürzel-Singhabicht; in Spanish, Azor-lagartijero Somalí and for the Japanese ornithologists the somewhat fanciful name of higashikoshijiroutaootaka. 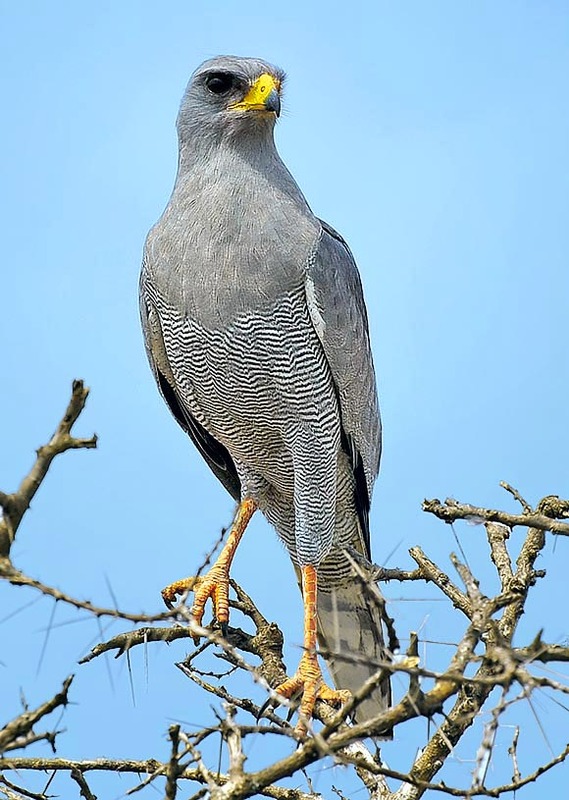 The Eastern chanting goshawk, as the name itself says, lives exclusively in the eastern part of the African continent, including in this area the Horn of Africa east to the Rift Valley, Uganda, Kenya and part of Tanzania. It is fairly rare in the western part of Kenya, more humid and more wooded, where it is replaced by the Melierax metabates. Common and widely diffused species, it is usually met alone and is paired only during the reproduction period. It is easy to be sighted on the field because its loves to stay on the highest available point of its territory, perching on top of the few trees or, when these are absent, on the small shrubs present, from where it observes with extreme attention each slight movement. Also the electric power poles have become an ideal observation place. It does not fear the human presence, cohabits with the local populations and is easy to approach. It is a sedentary species and only occasionally have been reported seasonal wanderings, possibly due to long drought periods. It lives in locations more arid than those of its congeners preferring grassy savannas with sparse woods of acacias and often in barren and sunny lands. It is found also in pre-desertic zones with low shrubby and thorny vegetation. Exceptionally, only in Ethiopia, it is found at more than 2000 metres of altitude, height limit of its ideal range. 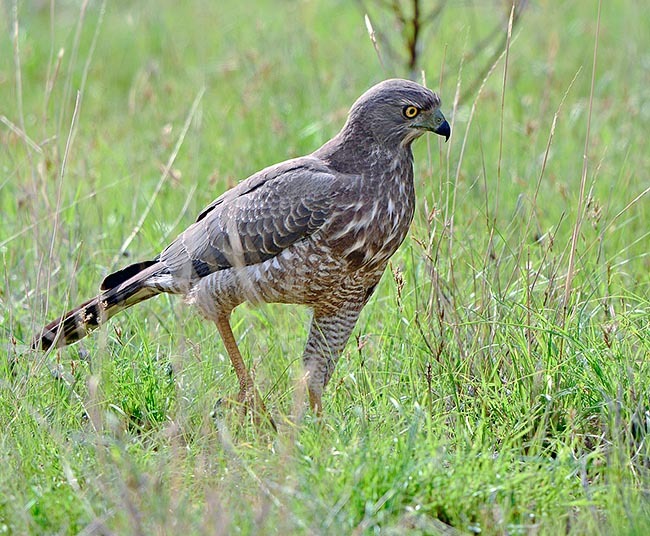 Also this goshawk, similarly to its congener Melierax metabates even if in a lower extent, loves hunting on the ground, running after, among the bushes, the rodents and the small reptilians and not disdaining at times to plunge headlong into the thorny bushes for reaching the prey. It is not an endangered species and it does not seem to have any difficulty in integrating with the anthropic evolution of the inhabited areas. 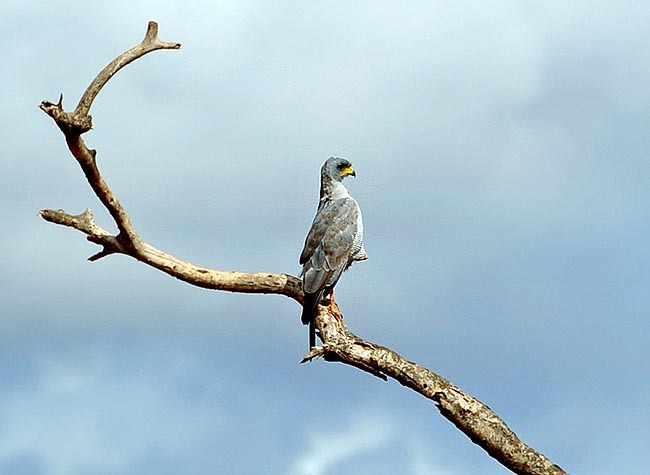 This goshawk has practically a size similar to that of its two African congeners with a length of about 50/55 cm and a wingspan of 100/110 cm. The male reaches about the 85% of the size of the female which, as in all raptors, has bigger dimensions. It has no noticeable sexual dimorphisms but in the size, as the livery is almost similar among the adults. As mentioned before, the legs are very long, suitable for one of its preferred hunting modalities consisting in running after, on the soil, the small preys. The base colour is the grey ash which covers totally the head, the upper part of the body and of the wings which show a slight whitish bar. The chest has a very fine and elegant paler longitudinal strikethrough and the undertail is white. The primary feathers are black whilst the seondary ones are of a very pale grey. When it is motionless at attention in its martial position, characteristic posture of this bird, we can easily note the difference between the compact grey of the upper part of the body with the lower part that is almost whitish. It is easy to say that this goshawk has yellow legs instead of orange of the similar Melierax metabates, which has vivid yellow cere of the beak instead of reddish of its congener, having the black belt on the lower part of the primary remiges ampler than the other species. All characteristics that are often distor- ted in the wild. The vividness of the colour and the precise identification of its gradation are not always so evident as described in the literature. There can be variations due to the age of the subject, the glare of the light of the savanna and also small genetic variations of the subject being analyzed. The fact is that, as already stated, essential is the knowledge of the place of the finding. The tail of the adult is black and streaked white with bright white upper tail coverts well visible when flying. It has scaly feathers, with the central ones longer and progressively shorter towards the outside. The young have a reddish and greyish livery somewhat different from that of the adults, so much to create often the doubt that it is matter of another Accipitriformes. These ones are practically indistingui- shable from the young of the Melierax metabates. The wing beat of this bird is deep and is done with rigid wing. It whirls keeping the wings completely flat whilst in the slide catch often leads the like a V as the harriers do. The chant, hence comes the scientific name given to this bird, is emitted at the beginning of the matings season when looking for the female, the male emits its known trills staying on the top of the tree chosen for nesting or also during short whirlings above it. It often emits the trills during the night especially when there is the moonlight and at times it as been seen whirling also in the dark. A long and mourning piii.piii.piii spaced with a strong and sharp pliii iù. This goshawk doesn’t have a particular nesting period. It choses it each time depending on the availability of food the natures offers even if usually it occurs by the end of the dry season. In fact, it predates small birds, rodents, lizzards and often insects it can more easily find during the rainy season. The nest is a flat structure usually placed high on the spiny acacias or on evergreen trees. It is a construction of dried branches covered by small small leaves and dried grass. It lays 1 or 2 eggs it incubates for about 5/6 weeks. The nest is often predated by big night birds but also by the tawny eagles (Aquila rapax) and big raptors. Usually, only one young flies off even if there are no records of instances of fratricide. The young appear not hurrying in flying off and only after many weeks and frequently after two months, they finally leave the nest.